Harry and the Hendersons occupies a unique place in history for Spielberg fans and soundtrack collectors. 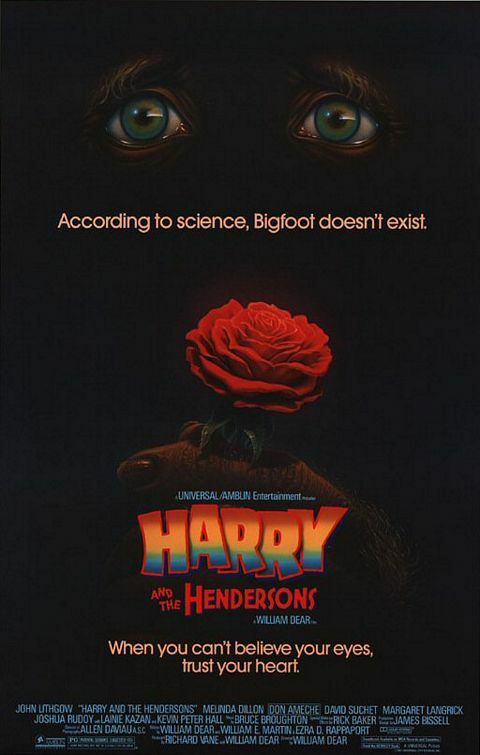 Opening on June 5th, 1987 after a mysterious “E.T.” style marketing campaign, it was one of the final big three swan song to the Golden Age of Amblin Entertainment; along with “Innerspace” and “Batteries Not Included”. Amblin would go on to produce all sorts of other films and television projects, but aside from the SyFy Channel miniseries “Taken”, none would have the specific Spielbergian feel of those films (and the series “Amazing Stories”) from 1982-1987. The story and setting are pure Spielberg. 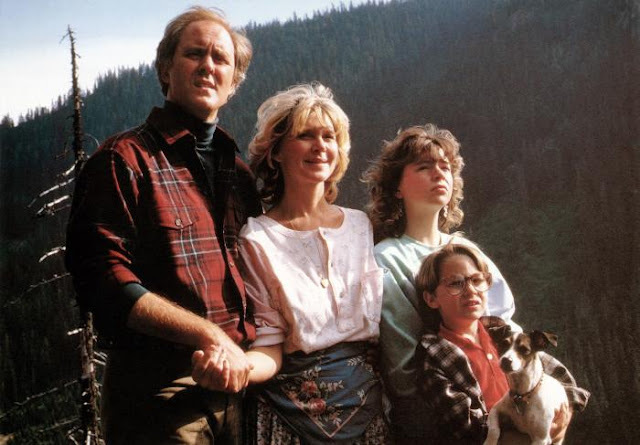 John Lithgow plays George Henderson, the ineffectual father of a dysfunctional nuclear family. George longs to be an artist but settles for working at the family business, a gun shop catering to hunters. He suffers daily at the hands of his bullying father who belittles George and mocks his artistic dreams. Enter the outside supernatural force, this time in the form of a sweet, giant Bigfoot creature named Harry. Through his interactions with Harry and the close friendship they develop, George learns to stand up to the bullies in his life, protect those he loves, pursue his artistic dreams, and win the respect of his family. “Harry and the Hendersons” may not be “E.T.” and writer/director William Dear is no Spielberg, but thanks to a terrific performance by John Lithgow and great work by Kevin Peter Hall inside Rick Baker’s Oscar-winning make-up/creature effects suit—the film works beautifully as a sentimental suburban fable with a lot of heart. The movie benefits immensely from the outstanding score by Bruce Broughton. The composer had been tearing it up in the mid-1980s. You could make the argument that Broughton was the best composer in Hollywood from 1985-1987, a period that includes his Oscar nominated “Silverado” (1985), the sensational “Young Sherlock Holmes” (1985), “The Boy Who Could Fly” (1986), “Monster Squad” (1987), and four episodes of “Amazing Stories” (1985-87). Released only on vinyl and cassettes that quickly disappeared, both the score and the end credits song performed by Joe Cocker were unavailable for years. Finally in 2007, Intrada gave this treasured soundtrack a proper release in a special limited edition CD that can still be found in the aftermarket at a reasonable price. The first track on the soundtrack album is the bittersweet Joe Cocker performed song “Love Live On”. It is a wonderful, heartfelt track that really captures the essence of the film’s sentiment. The song features the music of Bruce Broughton’s main theme and was written by Bruce Broughton and Barry Mann, with moving lyrics by Cynthia Weil and Will Jennings. 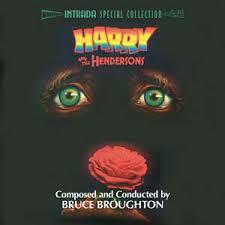 The soundtrack smartly introduces the main theme in “Main Title”, a wonderful, jaunty, Mozartian arrangement that bounces the film energetically through the opening credits setting up the Henderson’s first encounter with Harry in “Taking Harry Home”. After that Broughton carefully warms up the big guy to the audience allowing the audience to bond with Harry in a series engaging cues that include “Taking Harry Home”, “Harry In The House”, the exciting “Night Prowler”. In “Some Dumb Thing” we get a true introduction to the wonderful theme Broughton has composed for Harry, performed on woodwinds lead by a solo flute. “Our Little Pet” is one minute and thirty-nine seconds of pure sentimental bliss. This emotion-drenched music serves as a “B” theme for Harry and will re-emerge later during the film’s bittersweet finale. Action and suspense dominate the middle section of the album beginning with “Tracking Harry” as the film’s villainous trophy hunters arrive putting Harry in danger. The tension breaks for the gorgeous cue “The Great Outdoors” where we get to see Harry at peace in his natural environment. Then it is back to suspense and danger in tracks such as “Planning The Hunt” and “Night Pursuit”. A special mention should be made of “Drawing Harry”, a sublime low key track used to score a poignant scene in the movie where George realizes how much Harry means to him, how he must protect him, and in the process finally unleashes pent-up artistic ambitions percolating inside him. The movie drives toward the final act in the thoroughly entertaining action/comedic/suspense track “Traffic Jam”, 7:17 seconds of superbly rendered musical excitement, followed up with more propulsive music in “Footprints”. Then Broughton brings home his symphonic gifts and command of orchestra to set up for a memorable finale. If you have any love for film music and respond to it on a visceral and emotional level, then it would be best to listen to “Goodbyes” when you are alone. It is a gorgeous, achingly sad, sentimental cue that embraces and wrings out every drop of emotion out of the film’s bittersweet ending. If you have seen “E.T.”, “Super 8”, and “Rise of the Planet of the Apes” and listened to these soundtracks, you know exactly what I am talking about. 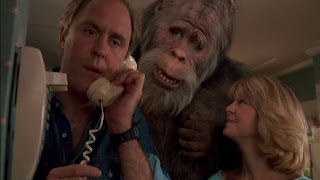 Bruce Broughton’s “Harry and the Hendersons” is musical masterwork to an overlooked and underrated 80’s Amblin classic. It is a must own soundtrack for any film music fan.